Low power consumption, with high-quality integrated circuits, mini body will be able to issue alarm sound up to 130 dB. 3) Small and sleek, easy to carry. Metal touch design, sleek and lightweight, comes with a key chain,lanyard and LED light, beautiful and also self-defense. 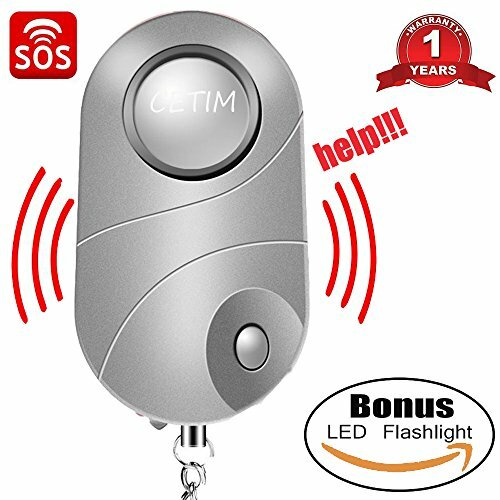 Simply activate this personal alarm system by pulling the safety pin and it'll release a loud, attention-calling shriek. If you're under attack, this will definitely scare your attacker, and at the same time call others to help you out. The portability and ease of use of this alarm system makes it excellent for just about anyone! The personal alarm sound is very loud, please do not put by your ears. This item is not completely waterproof, please keep it in a dry condition as possible. At CETIM Trade inc, we believe in our products. That's why we back them all with life-long and provide friendly, easy-to-reach support. MINI LED Flashlight--Press the switch button to turn on this LED light with great assistance for low light area illumination & find a keyhole, as unique fashion decoration. Handy Keychain Design--Made of sturdy, durable ABS material.The keychain design is easy to attach with keys, backpack, lady's bag, even jeans, convenient and portable enough for you to carrying. Universal Use For All Ages--This personal alarm is suitable for Kids, Students, Women, Elders, and Night workers. It's a safety necessities for traveling, hiking, camping and walking the dogs.And perfect gift idea for Mother's Day. If you have any questions about this product by CETIM, contact us by completing and submitting the form below. If you are looking for a specif part number, please include it with your message.